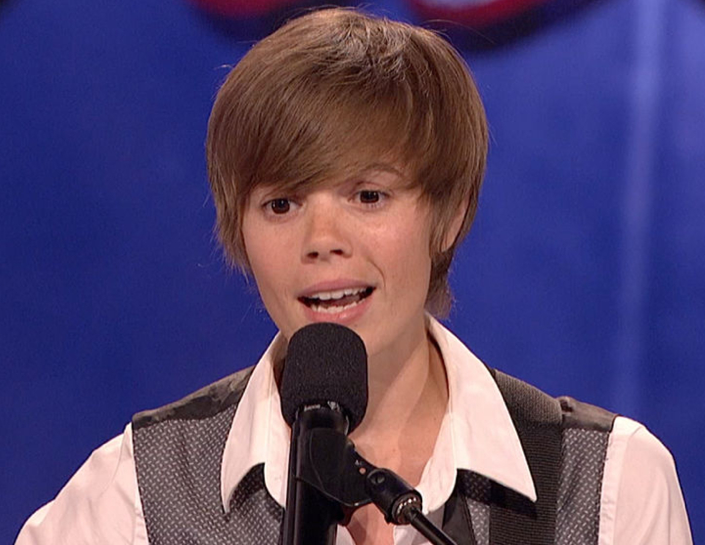 Did Justin Bieber, I mean, Dani Shay make it on AGT? After the opening theme and credits concluded, Nick Cannon reminded everyone what is at stake, "Twelve acts will perform, but only four will make it to the semifinals and a chance at $1 Million and a headlining show in Las Vegas." There is no more room for error. No second chances on America's Got Talent Live - Hollywood #2 - Tuesday, July 19, 2011. Through the two-hour AGT show, there were some WOWS, but more WHOOPS. However, I see three acts that should easily go through to the semi-finals, but I'll need your input on the group that I'm not sure about. Last week, I picked three out of the four semi-finalists. This week, I feel confident with three of my picks, but you tell me who should be the fourth. Now for my picks. These are in order - best first. Silouhettes - So unique and creative. And they have unlimited room to grow. Only imagination can hold them back. I expect to see them in the finals. Daniel Joseph Baker - He is a born performer. He just needs to tone down his Lady GaGa flamboyance and he should do fine. I expect him to make it to the finals. Smage Brothers Riding Show - Initially, I felt these guys were more an element of a show. However, they were exciting, dangerous and dynamic. I'm still not sure if an audience can sit through an hour of screaming motorcycles. However, their Tuesday night performance had the WOW-factor. Dani Shay - Talented, but I have a real problem with her look. And she's trying to be too independent with her song choices. She needs to stay a bit more mainstream to win this, then she can go off in her message-filled world. Landon Swank - His previous auditions were amazing. Tuesday, he performed a really cool trick, but it seemed slow and there were loose ends. Why did he have Nick Cannon sign both sides of the mirrors? I understand why he signed the front, but why the back? I'm confused. Mona Lisa - They have the look, the voices, but were they strong enough? Like the judges have said many times in the past, "Your song choices tell us a lot about the decision making you would exercise as a professional. Did they pick the right song? Steven Retchless - He is an amazing athlete. It takes great skill to do what he does. But it seems that there are about a dozen moves he does on the pole and then the show repeats itself. Plus, I don't know if Joe Boxer Shorts of middle America is ready to vote for a guy swingin' on a pole. That ain't right. If you agree or disagree, feel free to leave comments below. It's getting interesting and I'm ready to defend my choices. I was right on three out of four last week. I'm confident I'm at least three out of four this week. Let me know what you think. No second chances on America's Got Talent Live - Hollywood #2 - Tuesday, July 19, 2011.